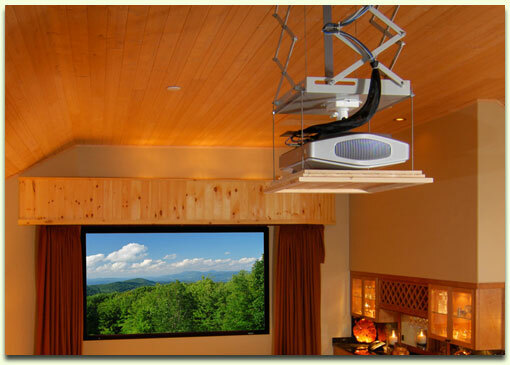 Sony Front Projector Custom Mounted on a Lift that retracts into the ceiling when powered off. What display is best suited for my particular installation? The answer to this question is much more complicated than you might imagine. When selecting the right products we take into account the environment in which they will be placed. The distance of the display, viewing angle, and ambient light in the room are just a few of the many considerations that must be addressed in the process. To further complicate matters, the answers to these questions vary greatly depending on whether we are talking about 3D, High Definition flat panels, or home theater projectors. Luckily for you, MHS cannot only answer these questions, but we also have the engineering capability and products to fulfill your needs. My wife says I can have as big of a TV as you can hide in our living room. What can you do for me? If you can think it up, we can do it. In most cases, we have already installed something similar. MHS’s true value to you as a customer comes from our custom installation experience. Hidden behind motorized artwork, retracting into the ceiling, lifting out of the floor, behind one way mirrors, and built into custom cabinetry are just a few examples of what we can do. However, if you prefer your video displays front and center, we can hang a television on just about anything in any orientation. We relish a good challenge! The installation of my video equipment is complete. Now what? A great installation is only half of the story, your new video products must be properly calibrated to optimize their performance. At MHS, we have invested in the most sophisticated test equipment available to ensure that your picture is perfect. Calibration involves measuring the color and brightness of the display and setting them according to an industry standard. By properly calibrating your video display, you are not only maximizing your investment, but also seeing the picture as it was intended. Calibration comes standard with nearly all the televisions and projectors that we sell, but we can also provide this service to your existing displays. Our goal is to provide you with the absolute best picture possible. We look forward to speaking with you about the video aspect of your next project! Be sure to browse our installation gallery for ideas about what we can do.